‘Sari, not sari.’ UPDATED with new pix of Selena Saving Nepal! boring attempt to get people to talk about her again. Are Indians honestly offended by this or is just the rest of the world outraged by her use of the Bindi? Um, being Indian, personally I’m not offended. I just think it’s a little weird. I just find it random. I haven’t even heard her speak about a love for Bollywood or the Indian culture etc. If she was just a big fan, I wouldn’t even give it a second thought. I agree with you. I’m nothing close to Indian, yet alone Asian in anyway, and I’m pretty sure most people who are getting upset over her attire aren’t of that nationality/religion either. I think it’s great to have an opinion, but I feel if I had one on this topic (which I don’t), there would be little to no impact because it doesn’t affect me. A valid point. Also, if one wants to support a grouping of people, they are entitled, regardless of ethnicity. However, if that grouping of people are not complaining, then why is everyone else?? Indians are not paying attention to Selena Gomez, I can tell you that much. 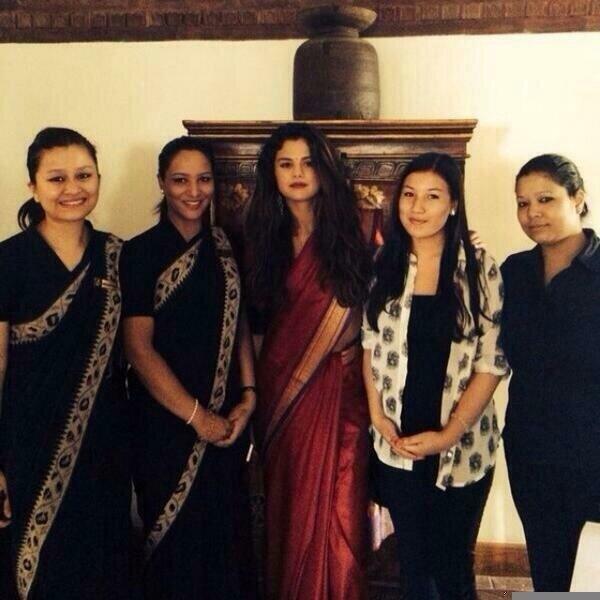 She is in Nepal. They dressed her like this. Why Indians would be mad? Do they don’t like Nepal costumes? From what I can see, it looks like a Sari to me. So I don’t understand the caption. No need to be rude & use vulgarities. I was only wondering because I honestly didn’t know. After reading your comment multiple times, I finally understand. I appreciate the explanation though. People say “sorry not sorry” genuinely meaning “I’m sorry, but I’m not sorry”, meaning I’m sorry about not being sorry. Her caption was just a play on words. She substituted sorry for sari. Don’t pay the rude person attention. That last line of theirs had absolutely nothing to do with anything and I’m sure Selena was not directly referring to wearing the Bindi. Hispanic accents had nothing to do with it either. To be absolutely honest I thought she meant you have to capitalize the ‘S’ in Sari and not write it like sari. Which is what some people do. Am I the only one who understood it that way? Like someone saying Bible not bible. That’s a nice way of looking at it, but with Selena I’m sure she was just messing around with a common phrase. She was just trying to be clever. The first S was capitalized probably because iPhones automatically capitalize the first word you type. What the hell kind of explanation? No. “SELENA GOMEZ INDIAN BIKIN” ?? You see, too many illiterate schizophrenics running around here. It’s polluting the administrators brain too. I think OceanUp just messed up on the title.